Every European tour needs Germany. You cannot ignore it, it’s big, sits in the middle of the continent and has a plentiful supply of fast trains. I travelled almost the whole length of Germany to get from Vienna to Randers (and slept through most of it), then took a somewhat shorter journey to get me to Kiel the next day. Now Kiel is a city built to be taken seriously. I remember thinking on a previous trips how the apartment buildings that line the walk out of turn just appeared big and sturdy. 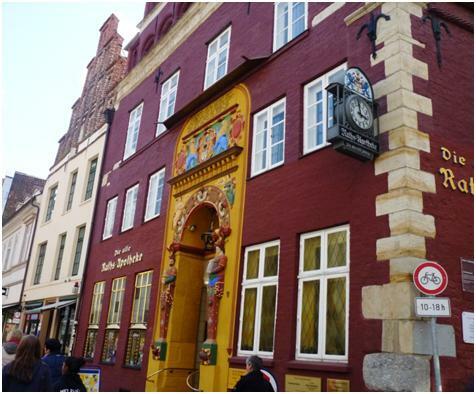 The Rathaus is not the most impressive you will see, but it commands the square nearby. On the side of the square is an opera house. No exactly an architectural delight, but a place to go and listen to the singing. Every thing about the city says solid  not so much as an act of defiance against the cold east winds of every winter, but a proclamation of victory against the elements. Even on a hot and sunny day such as this one, when I was walking pack to the Aldmarkt later in the evening (the location of a home brew pub with a pleasant dark beer), I could not help but notice the cold evening wind. 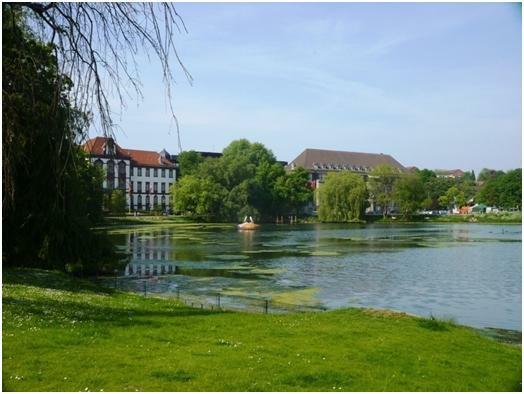 In the sunshine, the city appeared vibrant and lively, with market stalls jostling (not literally) for attention in the main shopping street, and the sun glinting of the waters of the Kleine Kiel  an inlet from the port surrounded by parkland. Kleine Kiel. The building is the background is the law courts. Like England, Germany is a large country, with concentrations of the population in small pockets, with the resultant concentration of numbers of football clubs. It has, like England gone through a series of re-organisations of the lower divisions, the last one creating a National 3.Liga, with three Regionalliga between this and the fifth level, still generally referred to as the Oberliga, as they approximate to the Lander, or states that make up Germany. There are two factions in German football at the moment. The big professional clubs want to run reserve teams as high up the structure as is possible, while the smaller clubs and their supporters have a dislike of reserve teams. They are poorly supported, and damage the competition. There is now a youth bundesliga, so why not a reserve one? The big clubs appearing to be holding sway, with a limited number of reserve teams in the 3. Liga, and large compliment in the Regionalliga. One way or another, while the 3. Liga appears to be a success, the 3 Regionalliga pattern is not holding up so well, with many clubs struggling financially. Therefore from next season, there will be five regionalliga. This clearly will cause complications as there will still be only three promotion places available, but promotion/relegation play offs have long been part of the German game, so this is not considered a big problem. 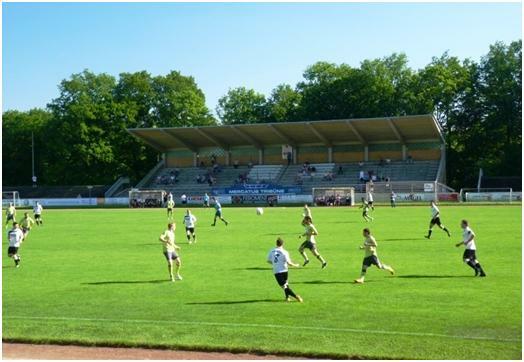 The effects of this on the lower leagues vary from place to place, and in the North, where the Nord Regionalliga will still cover four Oberliga areas, there is hardly any change at all. The Regionalliga is fed by four Oberliga, from the two cities of Bremen and Hamburg, the massive Neidersachsen, and Schwelsig-Holstein, which covers the northern most area of Germany, up to the border with Denmark. Below the Schelsig-Holstein Oberliga, there are 4 Verbandsliga, each promoting only their champions. Kiel sits within the North East area, and with only two league games to play SC Comet Kiel 1912 are in a safe mid-table position. The league finishes at the weekend, as the re-arranged fixture was the only one on the night. The visitors, TSV Altenholz had already claimed the title before the match began. But first, I had a problem, and I was not even aware of the detail. While I was walking around the city, I had noticed the bus departure boards were displaying a standard text rather than departure times, but I thought little of it, as I could see some buses and plenty of people waiting at bus stops. It was only while waiting for the bus to the ground that I tried to read the board. “Strike!”. I was of the opinion that no public service, (or for that matter anyone at all) ever went on strike in Germany. Surely it must be true, didn’t I read it in the newspapers? Without speaking English, those waiting with me at the bus stop confirmed there was a strike, but then a number 200 bus turns up. I wanted a number 11, but I got on anyway. This took me to a point about a 15 minute walk from the ground, (the 11 would have left me a little closer). It was only at the refreshment hut in the ground, when I explained that I was worried about getting back to town (a process normally referred to as “fishing for a lift”), that was explained that it was only one company that was on strike, and the buses on route 200 were running normally. And so, the only problem the strike created me was the 15 minute delay (between the two departure times) in returning to my hotel. SC Comet Kiel is exactly the sort of club that I think the UK pyramid has lost touch with. It sits on the edge of town, near a small urban community, tucked between a residential street and a bye-pass. One enters up a few steps, finding yourself by the clubhouse, and with about four steps of terracing down to pitch level. All along the opposite side are two shallow steps, with a grass bank above. Behind either goal, there is nothing except a grassed path. As well as the clubhouse, a further hut was providing hot food and beers, as is traditional in German football grounds. An A4 programme was provided free with the 4 admission price. The match took a while to warm up  not entirely surprising for one that had no importance for either team, but eventually it opened out in a pleasantly entertaining the match. This is amateur football, after all, careers are not dependent on the result, and the players might as well get on and enjoy it, which is what they did. Twice in the last fifteen minutes of the first half, the away team took the lead, but on each occasion, the Comets levelled the scores. Breakpoint. The last view one gets of Germany when leaving via Puttgarten  or the first point when returning two days later. The last of course, can be later the first, and so two days later, it is the same view but in the reverse direction as I re-enter Germany. The train is packed and many of its facilities were not working. No hot water in the buffet, no flush in the lavatory, and no signs on display to show which seats are reserved and which are not. The train staff are unresponsive  when asked which seats were reserved, we are told “all of them”. All those without reservations can do is take a seat and hope no one turns up to claim it. For once, I was lucky and managed to keep my seat all the way from Copenhagen to Hamburg (about five hours). I saw plenty of others who were not so lucky, spending a good part of the journey sitting in the corridors. German railways have practically given up this route. Not only do we get the faulty rolling stock, but there was no ticket check on the train during the whole journey (and there was none in the opposite direction two days earlier). Entertainment on the train was provided by the already drunken supporters of the Danish national team, who for some reason were playing Brazil the following day, in Hamburg. The journey from the centre of Hamburg to a middle class northern suburb is straight forward, using the U-Bahn. From the U-Bahn station, it is about a 15 minute walk straight up the road to the Hoheluft Stadion. A 6 ticket gets on in, including a free A4 programme, but this is a ground where the extra 2 for a seat is worthwhile. There are good terraced areas, sections of concrete steps behind one goal, opposite and next to the stand, but there are also massive fences all around the ground, meaning the only good views are to be had from the seats. The stand itself is a well elevated with plenty of rows of seats, but it is not at all modern, and this shows itself in the four support pillars partially blocking every view above the lowest rows. Clubhouse and dressing rooms are underneath the stands, while there is an outside sausage stall, with a somewhat temperamental mustard dispenser. This was of the pump action type, but no mustard appeared when I tried it. Pumping harder, there was a sudden splurge of mustard, most of which landed on my T-shirt, although it also managed to travel a distance in many other directions, splattering passers-by on their shoes. The only part of Hamburg not to receive mustard was my sausage. At this point, as a favour to life in the region, I took the lid off the dispenser, and dipped my sausage instead. [I know this is all in Hamburg, but no euphemisms or double-entendres are intended, this is just a story about a half time snack]. Victoria Hamburg Supporters in full voice. As for the game, well once again I was watching the league champions after the title had been decided. The away side was in second place, but likely to drop to third with defeat. This would not matter much as there are no play offs. I was more worried that Victoria would field a weak side, due to a local cup final at the same stadium on Monday. 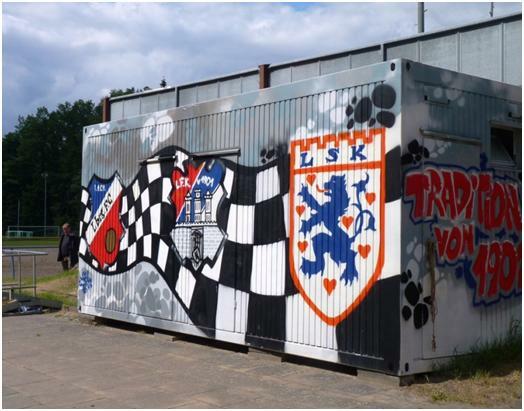 The local cup competitions, (Lander Pokal) tend to pass by without much notice around Germany. Fixtures and results columns often show the league matches only, and ignore cup games. These cup games therefore have to take place midweek at the start and end of season, or on bank holidays. 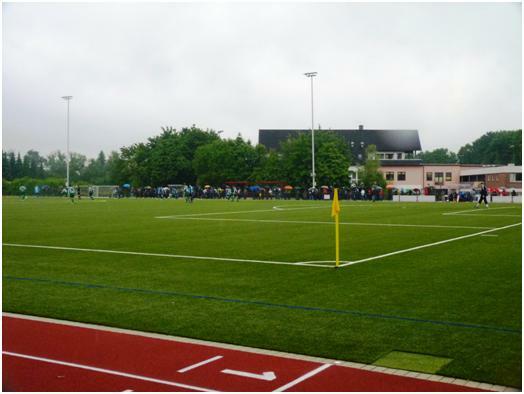 There are still a lot of teams, even in the higher levels of the amateur and semi-professional game in Germany that do not possess floodlights, so all the weekend dates are given over to the league, and the cups take what is left. Despite this, there is a big prize on offer. The DFB Pokal, the German cup is very limited numerically. It is also seeded. This means that merely being in the first round practically guarantees a home tie against a major team. Of course, less fuss is made over these in Germany, and should Victoria win through and get a good tie, they would switch the venue quickly and quietly. Still, there is only one way for the minor teams to gain this qualification, and that is by winning the local cup. I was indeed right about the game, Victoria were clearly favouring the Monday game. Many of players that normally start were missing, including both the two top goalscorers. At 248, the crowdfor the game I saw was probably around its normal level. The cup final would draw in over 4000. Still, I need not have worried about the quality of play in my league match. 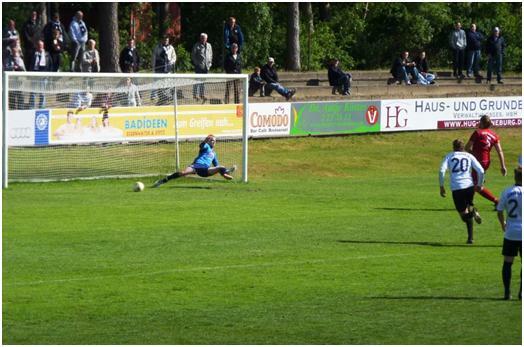 There was no doubt from the word go that Victoria wanted to finish their league campaign with a win, there was more doubt that Vfl Curslack/Neuengamme had the power to stop them. Victoria took an early lead, and added a second just before half time. When they made it 3-0, on the hour mark, it was beginning to look too comfortable, but any complacency was knocked away with the visitors pulling one with 15 minutes to play, and then scoring again less than five minutes from the end. The comeback was short lived, as while the visitors pushed forward for an unlikely equaliser, they left enough space at the other end for one of the Victoria substitutes to complete the scoring in a 4-2 win. Giessen is a pleasant if small town. It does not have a great deal to show to the tourists, except for the fact that it appears to be overrun with prehistoric beasts; well models of dinosaurs, woolly mammoths and other such creatures were scattered liberally through the town centre. I did notice the local brewpub, but I wanted to get out to Fernwald in good time, as the buses only run once every two hours. This was a decision I came to regret. I am not certain that Fernwald actually exists as a town, rather than a series of villages under common title. Certainly, there were several signs to places such as Fernwald  Steinbach, but none to Fernwald  Centre. The bus dropped me at Steinbach Hauptstrasse, which for those who know even less German than me, translates as Main Street. It is indeed the main street of the village, it has a chemists (shut), a bakery (shut) and a pub (I checked the sign outside this, open Mondays, Wednesdays and Fridays only). Being as there was a bench by the bus stop, I sat and read for a while, and may even have dozed off for a bit. Still, when I wandered down the road to the ground, it was still 90 minutes before kick-off. I did pass the church (which I guess is open on Sundays), another shop (closed) before I got there. The gates were open, but without anyone there. I expected at least one of the club bars to be open at this time, but I was too early even for this, and there were just a couple of people setting things up. I had to wait until about one hour before kick off before anything was properly open, and for someone on the gate to be equipped with tickets and programmes. Admission was 7, the programme was an A4 monthly magazine with a one page A4 insert (in full colour) for the days match. It was, as most in German are, free of charge. The beer was cold and wet, (Weizen, if you must know). The Steinback Sportsplatz is a basic railed off pitch, with a couple of steps of terracing on one side, and then a second pitch behind this at the higher level. The nearest thing to cover or shade was underneath the announcer’s tour. 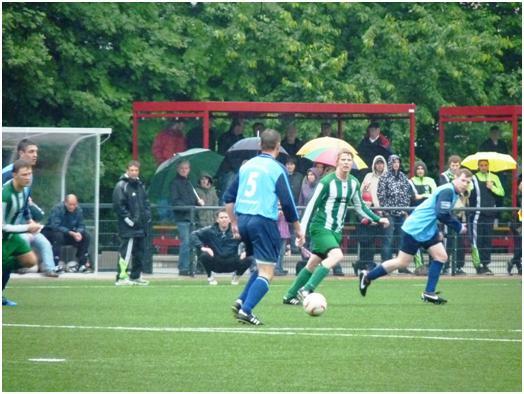 FSV Fernwald were confirmed as finishing in third place, regardless of the result of the final game. 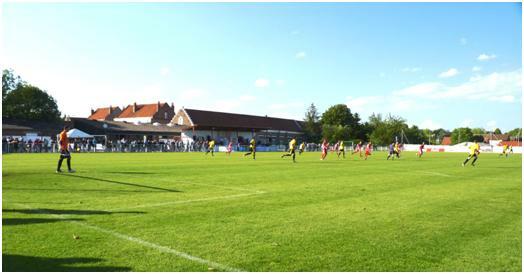 The Hessenliga is the highest level the club has even played at, (they arrived at this level in 2005). Visitors, Buchonia Flieden finished just below mid-table, and while a win could have taken them above the half way mark, there was no danger of relegation. Played at a 3 p.m. kick off, on a hot afternoon, it should be no surprise that the game did not come to a lot. Indeed I had written it off as a dullish 0-0 draw before a home substitute scored 8 minutes from time. Three minutes later, a penalty was converted to make it 2-0. There were 180 in attendance, most of which must have arrived by car from surrounding villages. Now my original choice of Fernwald was because the next level down, Verbandsliga Hessen Mitte had chosen to kick off its matches at 5.30 p.m. For some reason, the other two Verbandsliga that make up step 6 in Hessen (Nord and Sud)had chosen 5 p.m. kick offs. This meant that there was another club, VfB 1900 Giessen within reach for an extra game. A combination of two buses, a total of over 30 minutes on the bus when one runs only at two hourly intervals was never going to achieve the transfer, so my plan was to struggle across the language barrier and ask for a taxi at Fernwald. However, not long before kick-off, I spied the potential of being helped. At the right arrival time to have been on the later bus, the crowd was increased by a gentleman carrying a rucksack and carrier bag. A quick approach confirmed my suspicions, it was a groundhopper and Bayern München fan, by the name of Thomas. 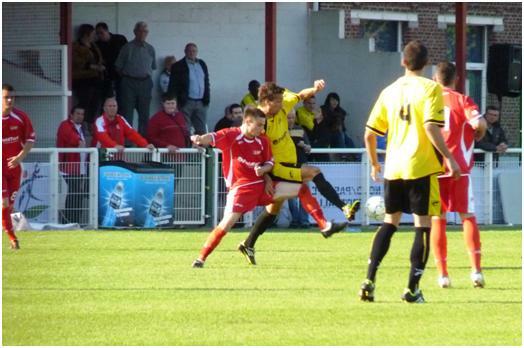 Thomas is not the standard groundhopper, as he has other interests as well. He was sandwiching these games in, between watching Bruce Springsteen concerts on both Friday and Sunday in different German cities. Appearing less organised than me, (which takes some doing), I am not certain that Thomas had found out about the difficulties in getting between grounds until arriving. Still he was agreeable over sharing a taxi, and at half time he got a home official to phone and request one for us. Almost immediately after this had been done, we spotted two other people taking photographs, and quick enquiries showed that they too were ‘hoppers, this time out of Bochum. They were driving, and had two seats free in the car  so poor Thomas went off again to ask for the taxi to be cancelled. I spotted at least one other person at the second game who had also been at Fernwald. By car, the journey between grounds was completed in no more than 15 minutes. 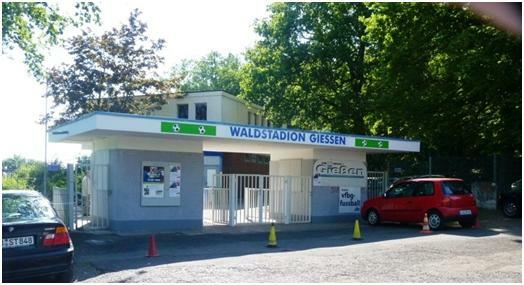 The Waldstadion Giessen may host football at a lower level, but it is a bigger and better ground than its neighbour. Indeed, until 2001, they played at a higher level than Fernwald. In 2001, they finished 9th in the Oberliga Hessen, then the fourth level of German football, but they hit the financial buffers and did not play at all the following season. In 2002-3, they had to restart in Kreisliga B, level 9! They were promoted in 2004, 2006, 2008 and 2009 although thanks to the additional level introduced in 2008 (when 3. 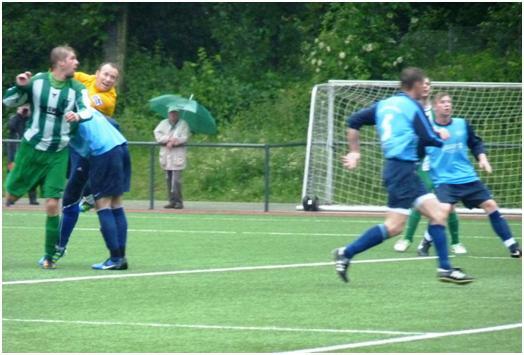 Liga started), the 2008 promotion took them from Bezirksliga (level 7) to Gruppenliga (level 7)! In 2011, they reached promotion play offs, but failed to go up, but 2011-12 was not to be their season and the finishing position (5th) was confirmed before our visit. It was the visitors, FC Eddersheim that needed the points. Starting the day in second place, but only one point ahead of their rivals, they needed to win to confirm second place. This would give them a play off against those in second place in the other two Verbandsliga, and FCA Darmstadt, third bottom of the Hessenliga. 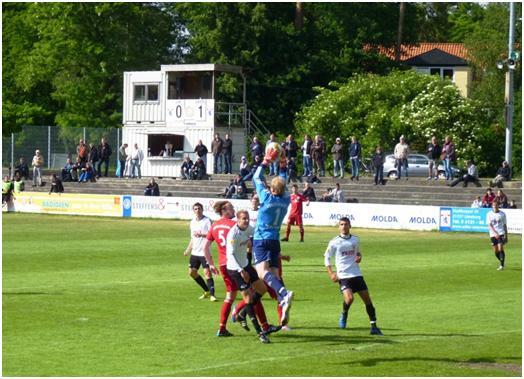 An added advantage was that the group of four were playing for two promotion places, thanks to the Viktoria Aschaffenburg deciding to make a geographical defection. Although within Bavaria, Aschaffenburg had been able to play in the Hessenliga on relegation to this level, which reduced their travelling, as they are not far from Frankfurt, but a long way from the major Baverian cities. Another team, FV Illertissen is making the same move from the Baden-Württemberg Oberliga. So in both these leagues, the top team, and fourth placed team gained promotion, while those in second and third were not eligible even for play offs. The Waldstadionhas its main stand opposite where we came in, with several steps of terracing each side of the covered area. 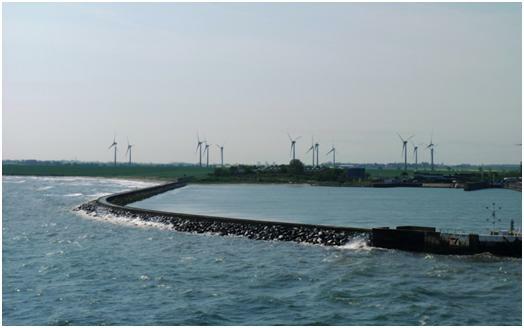 Both ends are curved to accommodate a track, and only flat pathways provide access in these areas. There are more steps of terracing on the side we entered, with a level terrace above this, and the dressing rooms and clubhouse at the back of this. Admission was 5, the programme was again a free A4 magazine, but while there was an insert to greet the visitors, it did not include match details. The team lists were provided on request, after which I pointed Thomas up to the club house, as Weizenbier was on sale upstairs, while the outside stall was offering only Lager and Sausages. As I said, the visitors needed the points to give themselves a chance of promotion by play offs, and their star in this bid was Julien Antinac, seen here being substituted a few minutes before the game ended. From the ground, there is a regular bus service into the centre of town, where a change of vehicles took me to the station. From there, it was train to Frankfurt, and after a night’s sleep a morning flight to Heathrow. Well before kick-off, I was at Wembley for the play off final, but the following Saturday, I was back in Germany to use the remaining two days on my Rail ticket. My return into Germany, via Düsseldorf Airport was just under six days after departing from Frankfurt. This turned out to be a slow airport to get through  a queue to get the passport checked, and a long distance from the terminal to the station. I remember the airport as having a rather dingy S-Bahn station in the basement. This is still there, but with the main line just outside the airport perimeter, you now transfer to this, using the Sky Train, which like the Schwebebahn in neighboring Wuppertal is an overhead suspension monorail. As a fan of Thunderbirds, these two car units still have a long way to go! There were several factors in decided which match I was to go to on the Saturday, many years ago while travelling on a train somewhere in Germany, I was talking to a citizen of Lüneburg, (that would be a Lüneburger, not a Lüney), and I recall being told that the town was well worth a visit. Having finally made the trip, I would not argue the point. 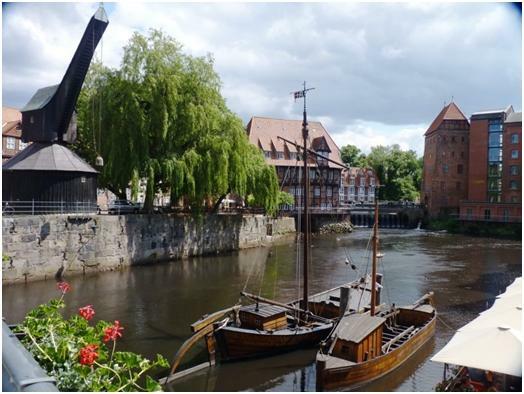 Although an inland town, Lüneburg was a member of the Hanseatic League, and made its wealth as the main supplier of salt across the trade routes of the League. 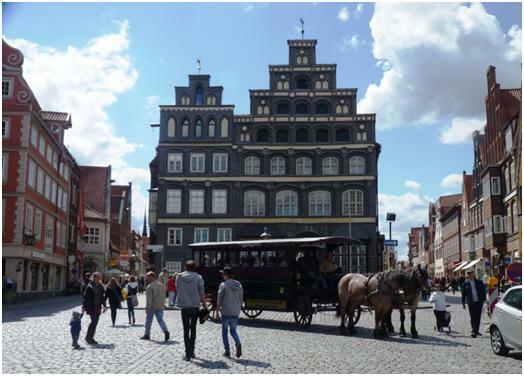 I am not certain what is required, apart from being a historic member of the league, for town in Germany to be referred to nowadays as Hansa, but the privilege was restored to Lüneburg in 2007. Cities such as Hamburg have long included the term in their full name. 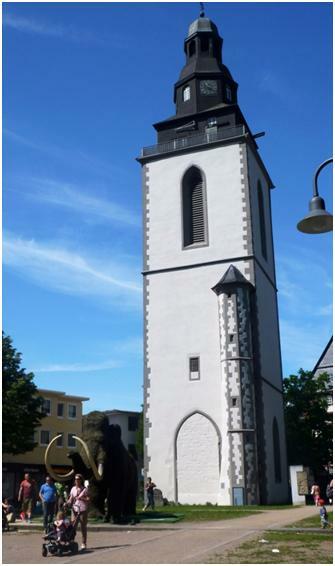 In the 1960s and 70s, the town, at the time still somewhat dilapidated in the post-war period, developed the concept of “cultural heritage conservation”, which basically meant restoring old buildings instead of just demolishing everything and building a new town, as is so familiar in much of West Germany. 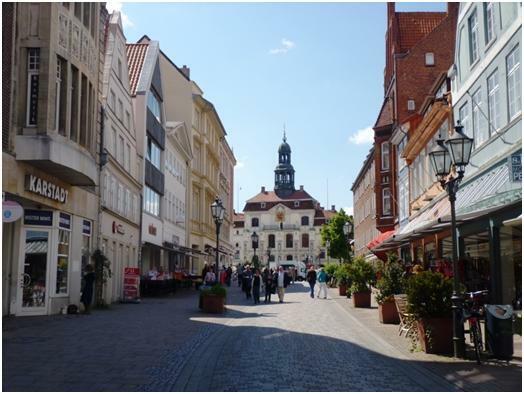 The idea, opposed at the time by local councillors and politicians has successfully restored the beauty of the town, and made it a centre for tourism. With the last salt mine closing in 1980, this is a useful boost to the local economy. From the centre, it is about a 30 minute walk to the Wilschenbruch Stadion, home of what is now called Lüneburger SK Hansa. I walked through an area of normal suburban housing and then across a main road, completing the trip with a five minute walk through woodland. Indeed to one side of the road leading to the ground, there is woodland, but the other side of the ground is anything but typical suburban housing. You need to earn a few bob before you can live around here. Without the word Hansa attached to the name, the club were moderately successful in the 90s, playing in the Regionalliga, then the third level of German football. Relegated in 1997, they had an unbeaten season in the Oberliga 97-8, winning 23 of the 30 games and easily returning to the Regionalliga. Already at the time, there had been talk of the club either developing the Wilschenbruch stadium further, or moving off altogether. They finished just above mid-table the following season, but there was growing disquiet in reports both over the level of accumulated debt (close to 400,000), and the lack of progress on stadium plans. Things were to come to a head in 2001, with the club again relegated  the mounting debts forced them into administration. 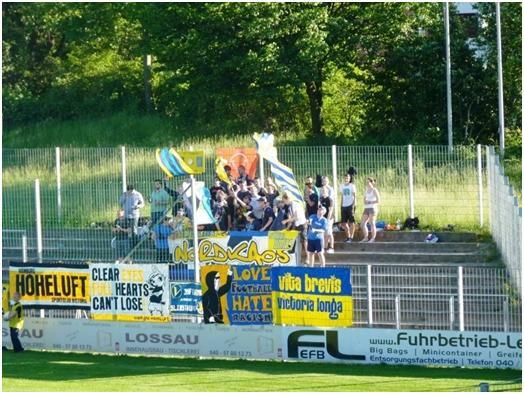 Most of the club’s support did not believe in a change of venue despite all this, as a photo from the time shows a banner behind the goal “We need LSK at Wilschenbruch, as much as the air to breath”, (or similar, and of course in German). From then on things move slowly. It will not be until the last shot of 2007-8 season that the name of the club is lost in a merger with Lüneburger SV. The new club is to be called FC Hansa Lüneburger. Yes, it celebrates the history of the town, but not of either football club. Fans, to say the least are not impressed. Some of the graffiti from 2008 has been preserved. The name will only last for three seasons and this season the club name is officially LSK Hansa, with the emphasis on the three initials rather than the word Hansa. Those that have come to the club from LSV were not impressed with this, realising that their club has lost identity and assets to the merger. The new slogan of the club is “Traditional club with Heart since 1901” (it looks better in German), but it is still labouring the point, and gives the impression of trying to impress too much that they are LSK, not some new fangled merger. Even if they have heart, one wonders if they have lost their soul. 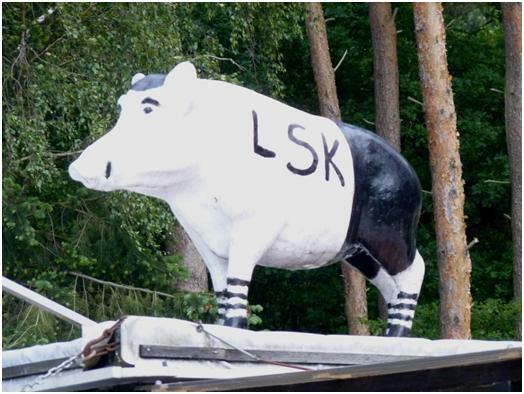 The Pig Supports LSK  The bad news for the pig is he adorns a Sausage stall. The name on the club shirts, and adorned in several places around the ground is that of the builder that expects to build houses on the ground. If you ask around, though, you get the impression that no one at the club is in a hurry for this to happen. The answers are vague “two or three years” or “maybe 10 years”. One can bet that the builders are thinking somewhat sooner, whereas local residents may well be siding with the football supporters. Better to have a few hundred football fans wandering up the road every second week, than to have the green and wooded front outlook spoiled by a new development. 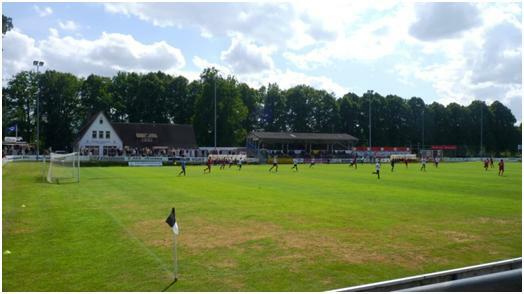 The ground itself remains a delight, the centre piece being the old stand, maybe too small for matches when the club was at a higher level, but now perfectly adequate for their needs. Around most of the rest are a few steps of terracing  just close to the entrance it is flat. 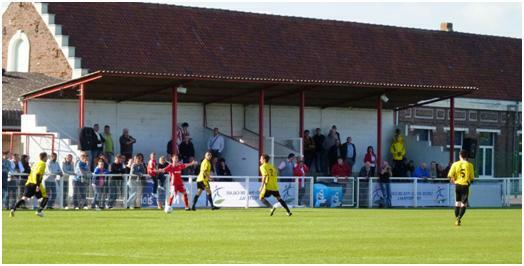 On the half way line opposite the stand is the announcer’s tower, with a coffee and beer bar underneath. That means that the crowd of 250 have no less than three places to buy beer, the announcer’s tower, by the sausage stall in one corner, and in the bar itself. I myself only had one beer during the game, and it had to be bought in the bar  the outside stalls only sell lager, while a bar sells a variety of beers. The home team laboured without looking likely to get back into the game, and they conceded a second with ten minutes to play. The season did finish on a slightly more upbeat note, as they scored a late consolation, but they cannot get a point from the game. Wilschenbruch in the Sun. 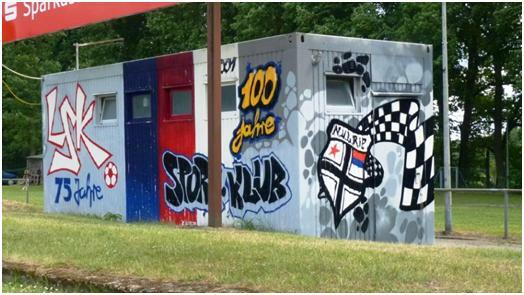 From the right, one can see the old hut covered by graffiti, the main stand, the clubhouse, and by the corner, the wurst stall. On my return to the station, I was met by a strange site. A policeman in riot gear, coming out of McDonald’s carrying a tray with four ice cream sundaes. The policeman then joined some of his colleagues. There were something like 20 police vans parked in the station, and around 80 police kitted out for a riot. I asked what was going on, and was told that with a far right march and a leftish counter march in Hamburg earlier in the day, there had been clashes, and both sides could be on the train coming in. The train I was about to board. When I voiced a bit of worry about this, I was told not to, the train might be empty. And indeed it was very quiet on board. Clearly the police knew what was going on, and knew when it was OK to just eat the ice cream and collect the overtime payment. As the train headed to Hannover, I noticed more overtime claims at every station on the route. 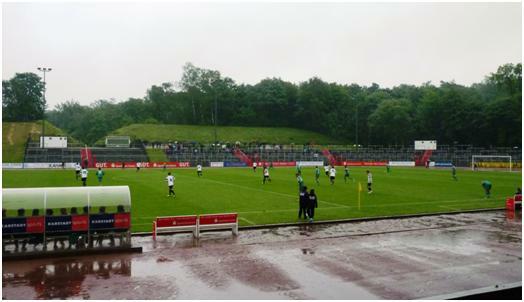 For Sunday, I was fortunate to be able to pick up two games in Essen, although as it turned out, there was not much football worthy of mention, and the weather was abysmal, raining quite heavily for most of the time until half time of the second game. Sunday morning games are quite common in the major cities of Germany, and Essen one of the most unexcitingly rebuilt is actually a bigger city than some of the more well known in the country. I am now getting back to this piece, more than a month after the Sunday matches around Essen, the football is well forgotten (not being very good in the first place). 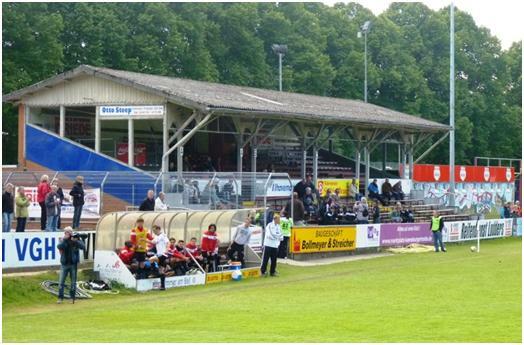 The first of my two matches was SG Essen-Schönebeck 19/68 . The two numbers in the name signify that the club was formed by merger at some stage. A small amount of research shows that this was true, VfB Borbeck and SC Grün-Weiss Schönebeck merging in 2000. The clubs are more well known for their women’s football team which plays in the Women’s Bundesliga, the highest level of Football in the country. However, the men’s and women’s teams do not share a stadium, and the matchday programme I obtained for my game made no mention of a women’s team at all. Playing in the Bezirksliga, at level 8 of the German pyramid, this was one of the lowest level matches I had seen in the country. The ground consists of an artificial surface, surrounded by a narrow two lane running track  this has a much sharper curve behind the goals than a standard track, to I am not certain of the circuit length, but it will be well under 400m. A quite wide path provides spectator provision on the entrance side, with two shelters (looking suspiciously like surplus bus shelters) sitting at the back of the area. The only way to get any sort of view from these was to stand on the benches and try and view over the umbrellas on the sidelines. The dressing room and club room buildings are joined on the upper floor, forming a bridge over the access way to a second, back pitch, (grass surface). Despite the rain and the early start, there was an outside barbeque serving the standard bratwurst, and a separate window off one of the buildings selling coffee and confectionery. I estimated the crowd at 150 (4 entry, programmes free), although the official figure was around half this. The visitors, SuS Haarzopf needed to win this match to confirm themselves as champions of the division on the day, although with two games to play, they could “do it in singles” with a point this week and next. By half time it looked as if they were getting their way. By half time, it appeared that they would win on the day, 1-0 up but comfortable, and a foolish second booking meant the home side had been reduced to 10 men. It turned out to be a frustrating second half for Haarzopf, comfortably on top, but never scoring again, and then conceding an equaliser 12 minutes from time. As it happened, other results favoured Haarzopf, who were handed the title by way of the afternoon results. SGS Essen-Schönebeck 19/68 v SuS Haarzopf, 1-1, the home team in blue. From there I retraced my steps back to Essen Hauptbahnhof, met up with Nick who had been to a different early kick off, and found the bus to Stadion Uhlenkrug, home of ETB Schwarz-Weiss Essen. A slightly unusual name, ETB is Essener Turnerbund, so the place name Essen gets mentioned twice in the club name. 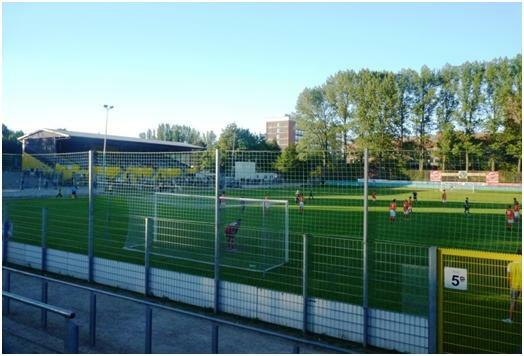 In recent history, Schwarz-Weiss have taken place in football within the city to Rot-Weiss  and with so many other football teams easily reached in the Ruhr, Rot-Weiss are not one of the best known teams in the area, spending only 7 seasons in the Bundesliga, and generally playing at second and third level, although recent financial problems have seen them drop to the level 4 Regionalliga. Schwarz-Weiss are only one level lower, but by the time we went there, they had already blown any slight chance of joining Rot-Weiss. The re-organisation of the leagues had allowed 7 teams to make the move upwards, including some play offs to give the champions of local leagues a chance. It was FC Kray from the Eastern of the city suburbs that took this chance and who now play a level above Schwarz-Weiss. Schwarz-Weiss won the DFB Pokal (German Cup) in 1959. This was four years before the start of the Bundesliga, when the top flight of German football was still regionalised, and SW Essen were the first team from outside the top division to win the cup. This is the highpoint of the club’s history. They remained second level when the Bundesliga started, and played in the second Bundesliga after it started in 1974, but fell out of the second level soon afterwards (1978). In their heydays, the grass banks you can see above the terracing and to the left of it were all given over to terraces. 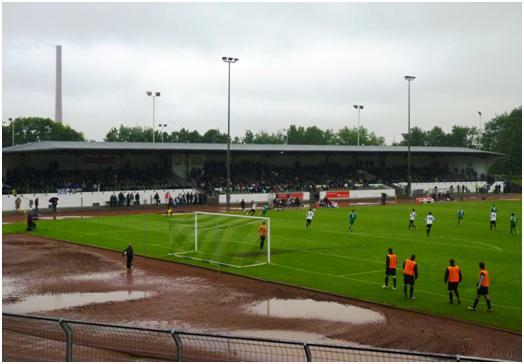 Schwarz-Weiss Essen did not turn out to be my last game of the season, as two weeks later I took a car load to France to see the final of the Coupe de la Ligue Nord pas de Calais. Although I have paid little attention to this in the past, it appears that each of the French regions runs some type of local cup. 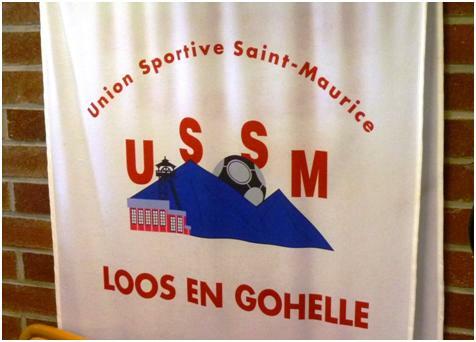 Some, such as this one appear to be limited to teams playing at local levels, while others, such as Corsica also involve teams from CFA and CFA2 at least. The match we saw was US St. Maurice Loos-en-Gohelle against AC Cambrai, and took place against the background of some quite tall slag heaps in this strong mining area. 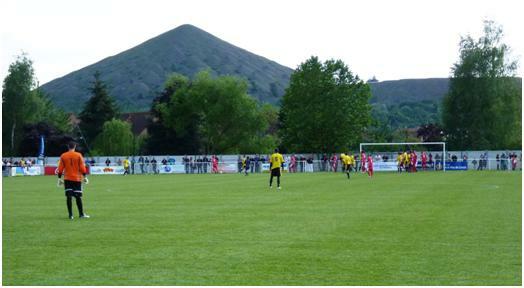 What appears to be hills on the club banner, are in fact slag heaps. The reality is almost as impressive. While UEFA’s executive met in Kiev this week, they could congratulate themselves on another successful tournament, far from the worst fears (or wishes) of the BBC’s Panorama. It has not been without incident, but overall the football has shone above other concerns. The legacy is eight large stadia, many of which will rarely be filled again, built at great expense to local taxpayers, during a recession. In better economic times, UEFA had decided to expand the tournament. There will be 24 teams contesting Euro 2016 in France  France also staged the finals (which meant four games then, semi-finals, 3rd/4th play off and Final) of the initial tournament back in 1960. On that occasion, there were only 17 teams in contention. Although Ireland played (and were knocked out in the preliminary round), there was no British participation, except Arthur Ellis refereeing the final. For 2016, France is a safe pair of hands, there is no need to build many new stadiums after a recent World Cup there. The new stadiums in Lille and Nice were long overdue anyway, but UEFA were supposed to announce the bidding process for 2020 during the Kiev meeting, and there was a problem. The problem was, there were only three bids, and none were ideal. Turkey had come close in the voting for 2016, and is still the favourite, but they would need to work on improving stadiums, and the country’s infrastructure is not well suited to the influx of fans. Past problems between Turkish fans and visitors during club matches, and an ongoing corruption scandal that sees some Turkish teams unable to compete in Europe do not help any Turkish bid, but the biggest problem is that Istanbul is a very plausible candidate for the 2020 Olympics, and staging the Olympics and the Euros in the same summer may is surely beyond any country’s capacity. The alternatives are the Celtic (capital C) bid of Scotland, Wales and the Republic of Ireland, or a hastily prepared by Georgia and Azerbaijan. Only the first of this pair put in a bid on time, with Azerbaijan adding their name after Baku had failed to make the Olympic short list. (International sports organisations find it difficult to work together, so UEFA had a deadline to submit bids of 15 May 2012, while the IOC announced their shortlist (Madrid, Tokyo and Istanbul) eight days later. Apart from Baku, the other city whose candidature ended in May was Doha, Qatar. And so UEFA have ratified the idea of a pan-European tournament. Having launched the idea in his pre-finals speech, Platini is claiming it as his own, and it may well be. IN an earlier speech he floated the suggestion that the 2022 World Cup could be pan-Arabia, rather than limited to the single state of Qatar. What Platini suggested was that 12-13 stadiums could bid to stage around 4 games each in a 24 or 32 country (yes, he did suggest 32), tournament. Going by the current favoured formats, of dividing the teams into groups of 4, and then a knock out section for the final 16 teams, (it would be 16 from either 24 or 32), then a 24 team tournament requires 51 matches, and for 32 teams, you need 63. Platini’s assertion that the travel across Europe is made easier by the new low cost airlines suggests that he has seen them advertised, but never tried to book flights himself. For example, Wizz Air provides flights between London and Kiev, and will sell me a ticket booked a month in advance for around £200 return. I could have bought a ticket to the Euro final ten days before it was played. The match ticket was not expensive, but Wizz Air wanted over £500 for the return flight. Regular supporters of England or of clubs who use these airlines to travel abroad know that it is imperative to book quickly, and many are hovering over their computers as soon as the draws are made. But this does not mean Platini’s ideas are without merit. To build more stadiums which are not required by the domestic game, and therefore have no use after the tournament is madness  even in good economic times, while UEFA’s baseline for a tournament (2×50,000 seat stadiums, 3×40,000 and 4×30,000) can only be met by a small number of elite countries. Glancing at the current lisitng for the Turkish Superlig, it has three stadiums over 50,000 but no more over 40,000 and only two at 30,000+. All the first three, and one of the others is in Istanbul. Azerbaijan and Georgia are in a similar position with 50,000+ national stadiums in both capitals, but then the next best in each country holds just 30,000. I do not believe a pan European tournament randomly selected could work, no country’s supporters could follow their team if the matches were in Gdansk, Glasgow and Geneva within a week, but if we looked at it another way, and said that Group A was, for example to be shared between Hamburg and Berlin, Group B between Glasgow and Dublin, Group C Zurich and Geneva, Group D Barcelona and Madrid, Group E Baku and Tblisia, Group F St Petersburg and Helsinki, then this could work. Each of the stadiums gets at least three matches, with one of each pair staging a first round knock out game as well. Under this plan, the first knock out round is on a weekend (maybe Friday through to Monday), with the quarter finals the following weekend (Saturday and Sunday) either on four stadiums in a single country, or at least neighbouring. 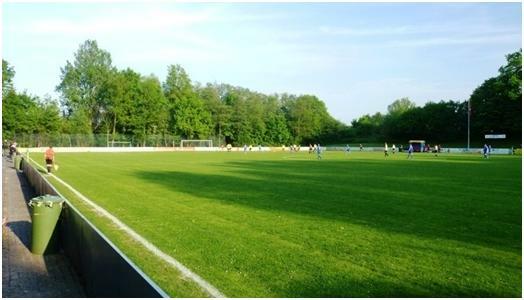 The teams then stay in the same neighbourhoods for the midweek semi-final games, and the final on the next Sunday. The biggest difficulty with this idea, and with any other realisation of the Platini suggestion is in making sure the ticket sales kept up well. A series of matches pairing Portugal, Czech Republic, Greece and Serbia might not pack them in, in downtown Baku. It may be necessary to have a series of potential hosts waiting, but none announced for this stage until the 24 teams are known, so as each pair of cities includes a local “host”. Meanwhile, Platini has made another point, and while I agree with the point made, I would take the opposite conclusion. Platini has said he is opposed to the use of technology because it would in time be more and more invasive. I agree, it will be, but I do not believe the game can stand still. It is no good for television audiences across Europe to see decisions questioned and shown to be wrong on a weekly basis. Platini is right to say that the officials made two mistakes, not one in not awarding Ukraine a goal against England. The ball did cross the line, but a player was offside. I am unconvinced about the goal line technology only because I am unconvinced about it working, but I am sure that this can be successfully introduced, it will be the thin edge of a wedge, with offside decisions coming next under TV scrutiny and others in time. You are currently browsing the Football Shaped blog archives for July, 2012.